T'is the season to be jolly! And boy, right now I'm as jolly as can be because I am DONE decorating the inside of my home for the holidays. 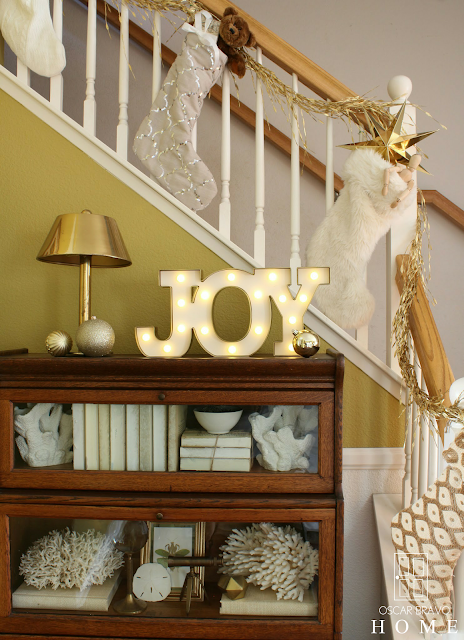 I don't go "all out" with my Christmas decor, but still, setting up for the holiday season takes a lot of time! Now comes the reveal where I get to show you what I've been up to these last couple of weeks. If you are new to my blog and found me through my blogger friends on this tour, then WELCOME! I sincerely appreciate you clicking on my name to see what the heck I'm all about. Let me briefly introduce myself. My name is Oscar Bravo. I am an interior decorator that is somewhat new to the scene. I am self-taught in the art of decorating and have never had any formal training. I really don't let that stop me since I learn best when I'm actually doing what I want to learn! 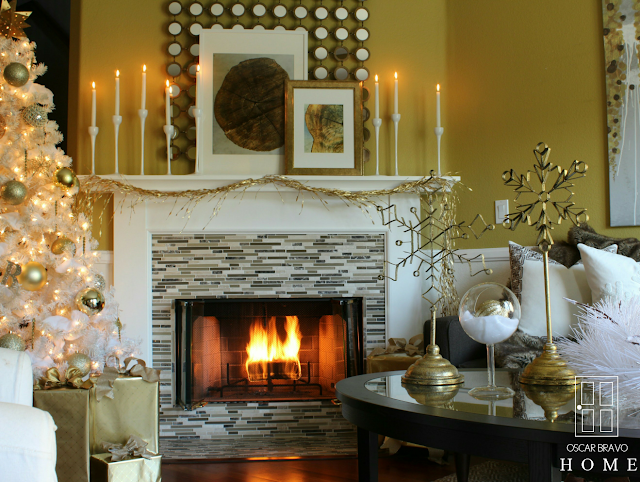 I believe that anyone should love their home and be able to get help with making their homes look great regardless of their budget. I've been blogging for only a few months and I already love it! 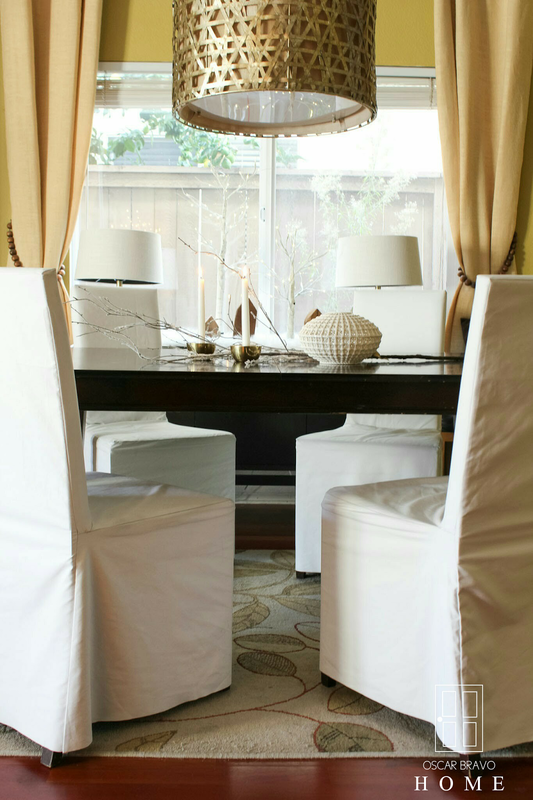 My goal is to share with you how I decorate and furnish my home and my clients' homes without breaking the bank. But enough about me, lets get started on this tour! We will start in the living area. 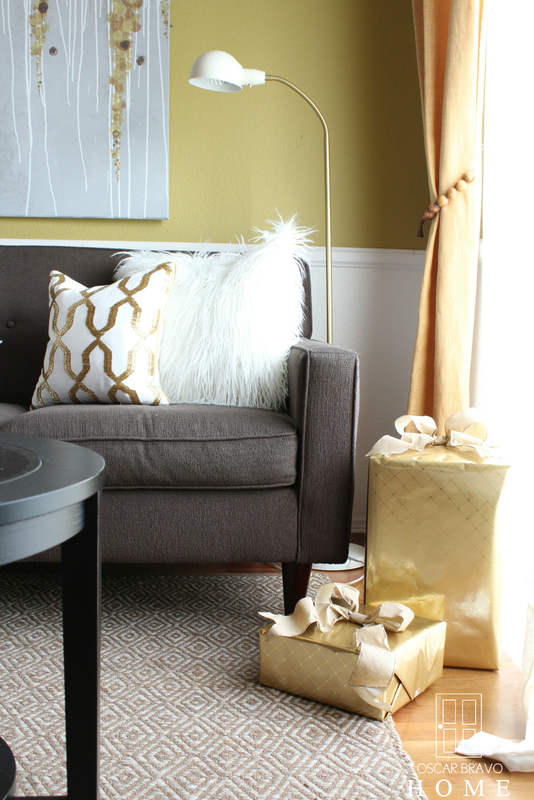 I kept my decor monochromatic with shades of gold and white. 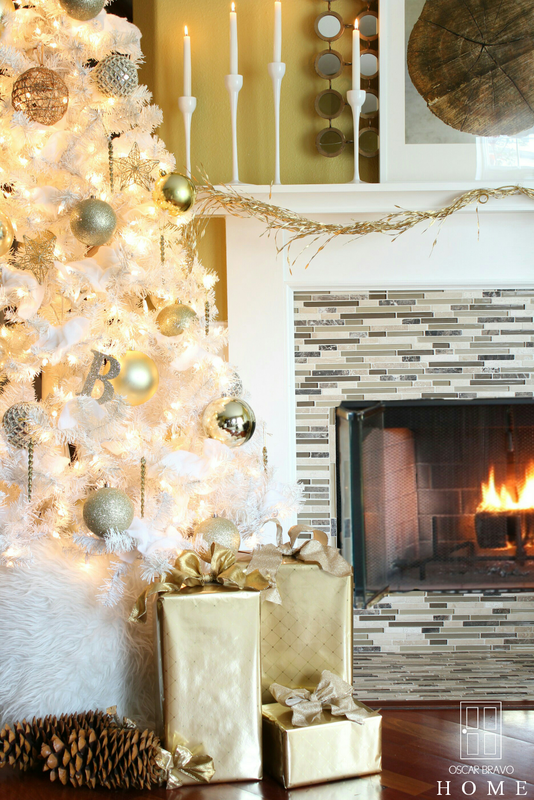 Why not much color you ask?It is because I already owned gold ornaments and this white tree from last year and I didn't feel like purchasing new ornaments this year. Shocking, I know. 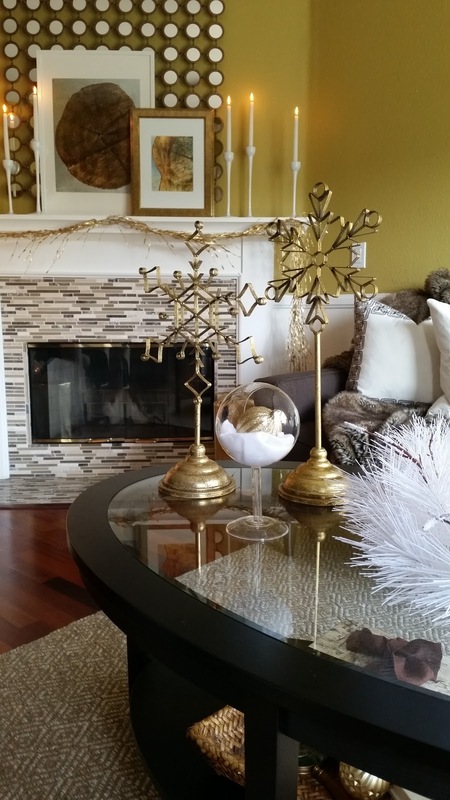 I did however make a new purchase with the cool gold snowflakes on my coffee table! I thought they were totally my style. I found the snowflakes at Hobby Lobby for 50% off! 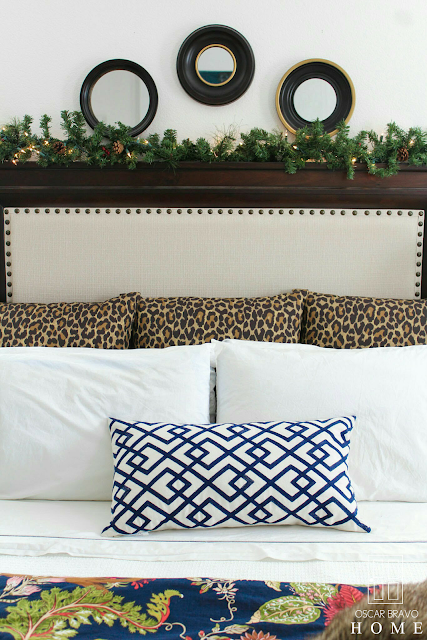 A quick way to change your decor up for the seasons is by using pillows. I found these at my local Home Goods store. 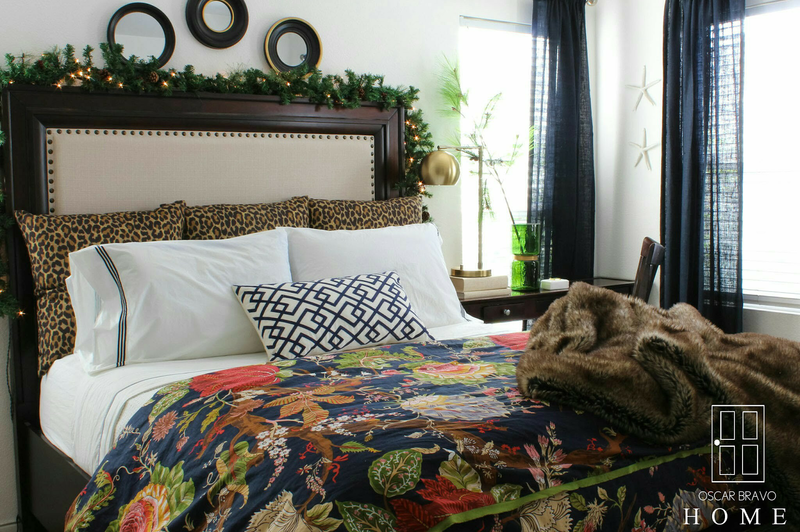 Don't forget to add a bit of fur to bring in some texture and warmth to your space. There are so many affordable options out there right now. I found this faux-fur pillow for about $20 at TjMaxx. 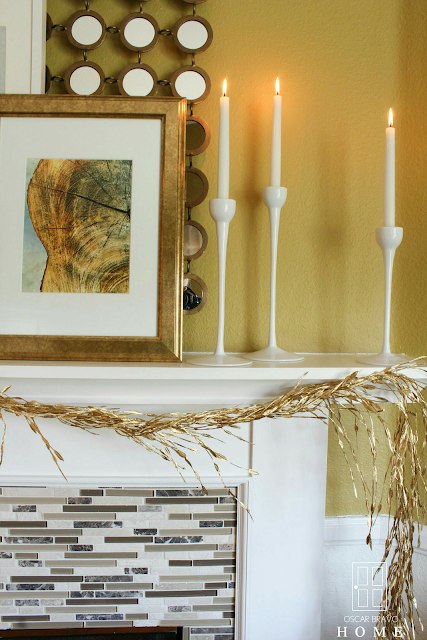 I kept my mantel pretty simple this year. I kept my autumn prints of my tree stumps because to me they still felt like winter. 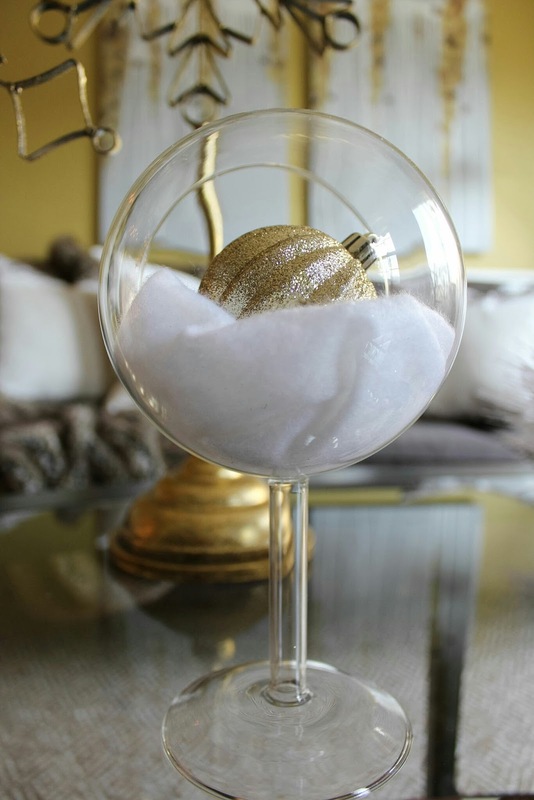 I went super simple with my tabletop decor this year. I layered a frosted white tree branch with a pair of my vintage candlesticks to continue my color scheme in the dining area. I love my little village on my sideboard. 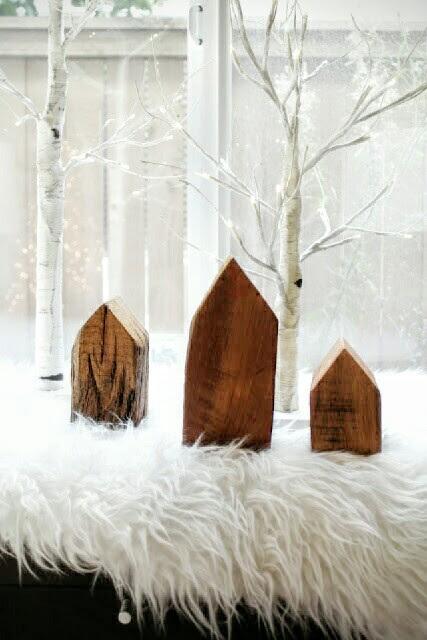 I found these light-up birch trees at Wal-Mart for less than $20! Now let's head up the stairs to the second floor. 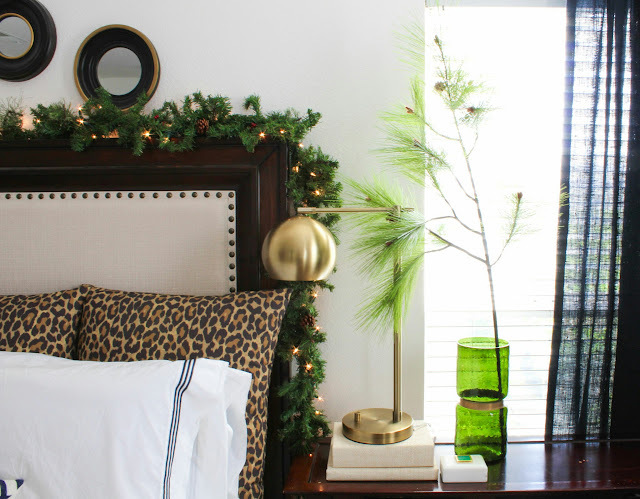 In my bedroom, I added some garland and a pine branch and it immediately felt like Christmas in there! I was like, BAM I'M DONE! Although I usually decorate the bedrooms for the holidays, this was my first year putting lights in my bedroom . I . LOVE . IT. Who knows, maybe I'll leave the garland and lights up year-round! And there you have it! I hope you enjoyed my little home tour! Please feel free to leave a comment. I love know what my readers are thinking. Also if you like, please subscribe to my blog to receive a notification when I post. You can also follow me on Instagram at @OscarBravoHome. Please continue the tour and see the beautiful homes of my blogger buddies by clicking on their links. I assure you, you will go gaga for their amazing homes. Thank you very much and happy holidays! Again amazing!!! Took my breath away can't believe i live here! This is just so beautiful, my friend! It's so inspiring to know you are self taught! Thanks for sharing your Christmas inspo with us! Hey Keila! Thank you very much for coming over here to check things out! Such a lovely tour! Your style is gorgeous, a combination of natural and bold! I love everything, can I visit and have a cup of tea in your home? Of course! It would be my pleasure! Especially if you don't mind bringing some of those no-bake fudge bars lol. Thanks Janine! Thanks so much, Laila! Happy holidays! Hey Tammy! Thank you so much for commenting!Im a big fan of your style too! Take care! So pretty Oscaaar! Love all your gold touches....and those snowflakes? the perfect touch! Thanks Coco! I appreciate all your support my friend! This was a stunning tour Oscar!! 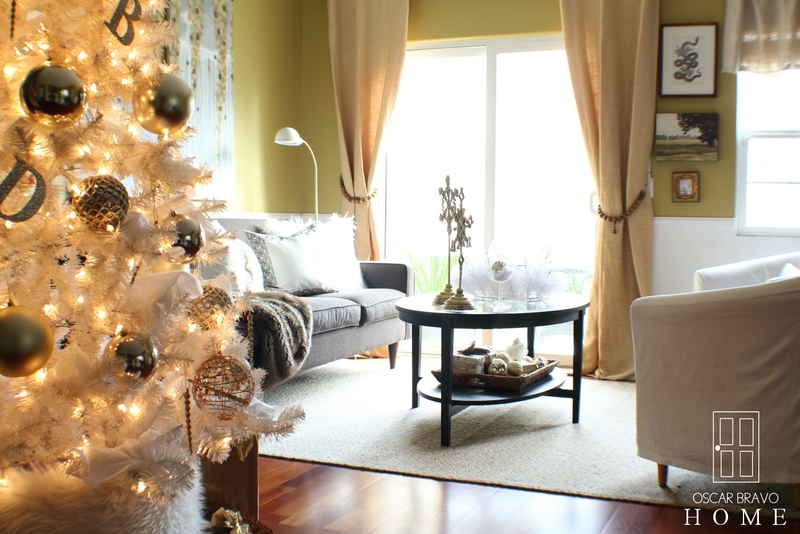 Beautifully decorated - every detail! This is so amazing! I love every bit! I think it is so great that you have learned everything and never actually had formal training! Apart from2 college classes I am in the same boat! You obviously have an amazing eye and it shows in your home. By the way, I am so jealous of your chair covers! I attempted some for my chairs, but they did not turn out very well! Maybe I'll try again. Have a wonderful Christmas! Thank you so much for your kind comment! I sincerely appreciate it.I say try again with your chair covers!you'll get it! Merry Christmas!